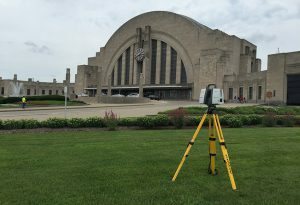 The Kleingers Group performed civil engineering, surveying and landscape architecture design for the renovation of one of Cincinnati’s most iconic landmarks. The historic renovation of the Museum Center plaza included the design of intricate paving patterns in multiple colors as well as the restoration of the historic fountain and limestone steps. A considerable portion of the entry plaza with hardscape, limestone walls, pavements, fountain, and plantings is all on the structure. New shrubs, perennials, ornamental grasses, and annuals modernize and beautify the space. The entry plaza is flexible to provide space for a wide variety of events. Parking spaces along the entry drive were designed to accommodate food trucks and vendors for events and festivals. Amenities like water and power were provided to allow setting up for events hassle free. Concrete plaza spaces flanking the entrance were designed so tables and chairs could be present during smaller events or left open for larger crowds during major events or concerts. Careful consideration was given to the design of the outdoor spaces to ensure the character of the historical plaza remained while allowing for modern-day events to take place seamlessly. The Kleingers Group’s Truescan3D team performed a 3D laser scan of approximately 600,000 SF of the facility, one of the largest scans ever completed in the region. From the building’s iconic rotunda, concourse and exterior, the Truescan3D team captured nearly 4.3 billion data points, resulting in precise measurements of every square inch of the space. Data from the scans were used to create a precise model of the historic building, updating plans that were decades old. This project received the 2018 NE Ohio Concrete Institute Project of the Year Award.